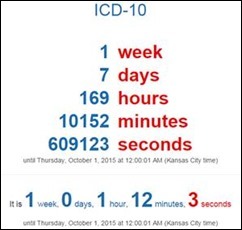 We’re just under a week until ICD-10 hits and I’m starting to hear about some potential issues. One of my colleagues received an email from his vendor informing him that although he had taken all required patches and performed all necessary steps, he needs to take another small patch. Needless to say he’s not amused and I don’t blame him. As one of the few independent small practices left in the community, it’s not like he has a full IT staff that he can just hand it off. I’ll be glad to stop receiving daily emails about ICD-10, especially the ones from CMS including these questionable graphics. Although the cardiology and orthopedics ones make sense, I’m puzzled why family practice is represented by the Star of Life, which traditionally represents ambulance and emergency medical services. If you look carefully, there are two snakes on the staff, making it the staff of the god Hermes rather than the Rod of Asclepius. Wikipedia has a great summary of the “one snake or two” controversy, including some ironic points, if you’re looking for a diversion. At least we’re not represented by an unfortunately stylized uterus or a sad-appearing bear, so I shouldn’t complain. It will be interesting to see if we have a government shutdown competing with ICD-10 for attention. Regardless, the work of ONC rolls on. Public comments are being accepted on a draft of the 2016 Interoperability Standards Advisory. The comment period is open through November 6. The Advisory includes not only recommendations from the HIT Standards Committee, but also feedback from public comments on the 2015 Advisory. Primary care physicians are nowhere near the top of the physician salary list, so they’re often concerned about the cost of delivering new models of care. Although they will receive higher payments if they can demonstrate greater quality, it often requires hiring more staff to implement programs to move the quality needle well before the first payment increase arrives. One of my former partners forwarded a Medscape article that lists the cost of maintaining a Patient Centered Medical Home practice at over $100K per physician per year. This represents the extra staffing needed for increased quality reporting, patient outreach, and care management. The data comes from a University of Utah study that looked at 20 primary care practices across Utah and Colorado. The data assumed a patient panel of 2,000 patients with an incremental cost per member per month of about $4. Physician leaders are using the information to help spur payment reform, including requests for upfront payments to transform practices and train staff. The study looked at practices that were already high functioning with EHRs in place. For less-advanced practices, the cost of PCMH will be even higher. I’m extremely happy to report that I have delivered my last scheduled ICD-10 training session. I left a few days open for last-minute stragglers, but it doesn’t look like I’m going to have any takers. I’m glad for a couple of days without client engagements so that I can recover from the last six weeks. I can only describe them as a slog. I plan to catch up on Netflix (“Call the Midwife,” Season 4 is beckoning) and rest as much as possible. I’m sure next week will bring some emergency consultations and I want to be ahead on my beauty rest. It won’t be all fun and games, though. I’ll be attending Monday’s FDA/CDC/NLM Workshop on “Promoting Semantic Interoperability of Laboratory Data.” I’m looking forward to the scheduled panel discussion on LOINC adoption. Although all the EHR vendors I work with support LOINC result codes, I’ve struggled with several reference lab vendors who fail to deliver the codes with results. Even the large national reference labs seem to struggle with this and I’ve had to push some regional lab representatives to deliver what my clients need. It shouldn’t be this hard. There’s also an open public comment section, but comments had to be submitted in advance, so I don’t expect much drama. I wanted to be a physician since I was small. Thinking back on a career in medicine that morphed into one in informatics, sometimes I’m still surprised by some of the things I end up discussing in casual conversations. LOINC codes are one of those things. I stumbled into a lab normalization project at my health system that led to a clinical repository project that morphed into a standardized order project. After beating my head against the wall with disparate lab systems as they gradually came together, I really became a fan of LOINC and it’s something I enjoy working with. I have a client who insists on pronouncing it “Low-Ink.” The first couple of times they said it, I had trouble connecting the dots to figure out what they were talking about. 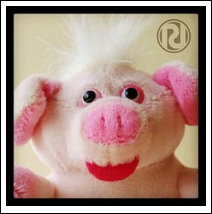 While I was cruising the LOINC website the other day, I came across this page confirming it really does rhyme with “oink” and also that the pig is the “unofficial official mascot” of LOINC. Have you worked with a vendor or a technology that has a mascot? Email me. That’s not a uterus on that icon, it’s a butterus!